A new financial hub is rising in Shanghai, aiming to rival those in London and New York. Twelve kilometers south of Shanghai’s existing financial hub of Lujiazui, workers are putting the finishing touches to a glitzy-looking office tower designed by American developer Tishman Speyer. The tower will be part of “the second Lujiazui”. Called Qiantan, the gleaming new area is aimed at appealing to multinational and financial firms, especially, looking for an alternative for costlier and crowded Lujiazui. Of the 1.65 million square meters of new office space planned in Pudong, across the Huangpu River from the city’s historic Bund, over the next five years, more than half is earmarked for Qiantan, according to Colliers International. In contrast, the core Lujiazui area will supply just 310,000 square meters. 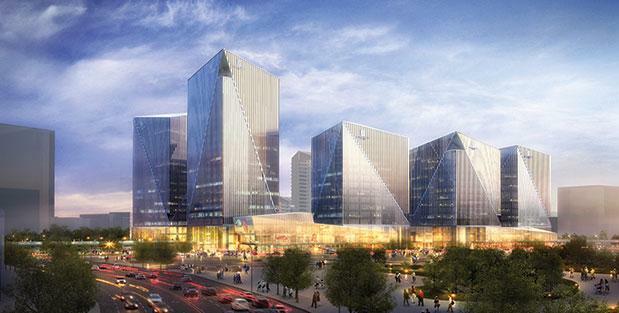 In the heart of Qiantan, four overseas developers – Tishman Speyer, Swire Properties, Hongkong Land and Shun Tak Holdings – have already formed partnerships with the biggest landlord, the Shanghai government-owned Lujiazui Group to create mixed-used complexes.The first developer to break ground in Qiantan was Tishman Speyer which built Crystal Plaza. U.S. conglomerate United Technologies and medical equipment maker Medtronic, and Germany’s Covestro are expected to become tenants of the office part of the bustling new commercial complex. “Our target tenants include high-end financial and ancillary services, and advanced manufacturing and technology firms. We are negotiating leases with medical, auto and other manufacturing companies from the U.S., Europe and the Middle East,” said Wilson Chen, Tishman Speyer China’s Chief Investment Officer, declining to specify any names, however. He said Lujiazui Group undertook the planning and development of the site, while Tishman Speyer was responsible for its design, securing global tenants, and managing the assets. The 2.8 square kilometer Qiantan area is connected by three metro lines, sits next to the Oriental Sports Center, and is near the former World Expo 2010 site. “Lujiazui’s issue is the lack of amenities. Outside of working hours there is relatively little reason to go there,” said James Macdonald, Senior director of Savills China Research. “But with residential communities and retail space, Qiantan will be a vibrant community that is live 24/7,” the South China Morning Post reports.